Solar Web Page > Categories > Solar Hot Air Collectors > Pop can collector question. A friend's son is making a pop can solar heater, and asked me if it is better to cut the whole top and bottom off each can in a stack effectively ending up with a simple tube, or to make a smaller hole in top and bottom of each can, which I thought would be better since it will, I guess slow convective air flow through the assembly and allow the air to pick up more heat as it passes through. Has anyone any thoughts on the subject? Thanks! 5 years ago pop can heaters were the biggest thing going until matrix-style heaters became more popular. The big thing about pop can heaters is how time consuming they can be to build. A lot of people switched to downspout or matrix heaters after building can heaters. My first heater WAS going to be a can heater. I was saving my cans, but before I had enough, I switched to downspout, and then matrix-style. If this is going to be a passive heater you need good airflow to move the air at an effective rate. So a more open design might be better. But if there will be a fan helping the airflow, a more restricted design might be better. One popular alteration to the cans is to have an open top and the bottom has vanes cuts to help swirl the air inside the tube. This helps to break up the laminar flow and allows more of the air to come in contact with the hot exterior of the tubes. My suggestion would be to make a few test stacks using different openings both top and bottom. Too much restriction will give you higher output temps, while a more wide open design may not heat up enough depending on the length of the stack. Place the test units inside an empty collector box to keep them out of the wind and measure the heat and flow from each test stack. The one with the highest BTU output is the winner. Thanks Greg, if they do try the experimental route of various configurations I'll post the resulting conclusions here! Colin. Colin, Welcome to the solar heating community! I did build a soda/beer can heater and it works great. After 5 years it is still keeping my 1400 sq/ft shop between 58 and 65 degrees all winter. Granted, I live in the high desert of So Cal and the shop is 2x6 insulated walls. Our low temp are teens and twenties. To answer your question: I cut the entire top and bottom out of the cans. It was so labor intensive just to do that, I didn't want to add more work. I figured the narrowing of each can would disrupt the air plenty. My output temp is near 140. I power the air flow with an 80 cfm computer fan. If you click on my name you can see my profile I think. Look for my project and you can see more about it. I don't recommend anyone ever building a can heater! Recycle the cans and use the money to build a two layer screen unit! Hello there from the UK, not been on here for a while (hibernating). 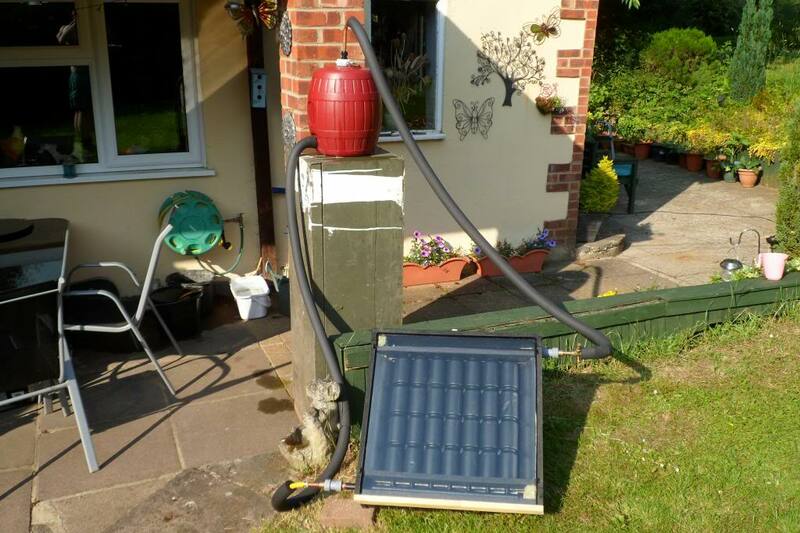 On my profile you should find links to a 2'x2' panel water heater I built from soda cans. I got very respectable temperatures at the outlet just with it heating air, so much so I had a perfect 22mm diameter burn on the palm of my hand when I decided to foolishly "test" how hot the outlet pipe was! I cut the can's top and bottom out fully using hole saws. Tbh once you get going it's pretty quick. A case of "just do it". If I make another or continue experimenting I may try a test column with a spiral of smaller holes up the outside to try and achieve some sort of self sustaining Venturi effect. No science behind this just guesswork and gut feel! Hi Onoff, Are you heating water? Your picture confuses me (easily done!).. How are you making the exchanger from air to water? The hot air in the can columns heat the copper tubes that are water filled. The stacked cans are sealed but probably not airtight per se. I took my cue from evacuated tubes and this was my poor man's version. Probably get some silly temperatures in the space between can and 15mm pipe. Someone on here reckons I've invented a new type of ARETHA (AiR Exchange Thermal Assembly). Check my content "An Englishman's First Foray..." for the whole build. Got some good temperatures imo for a 2'x2' panel. Really I need to build a bfo 8'x4' version and see how it performs just for the fun of it! Been away from the forum for a while but now Spring's approaching I might have another play. (I even bought a roll of aluminium insect mesh for a zero pass one). If it works with pop cans it'll probably work with downspouts, too. It'll be interesting to see how a bigger one performs! Is the air inside the cans hotter than the surface of exposed, black painted pipes? If so, how much? I'm not sure whether 110degC would be high enough?